This idea brings passing the salt to a whole new level! A transforming design that offers dining flexibility and also offers additional preparation space on the kitchen side when needed! Great! United Colours of Rhythmic Asymmetrical Cabinetry! The Mogul thinks this is great! 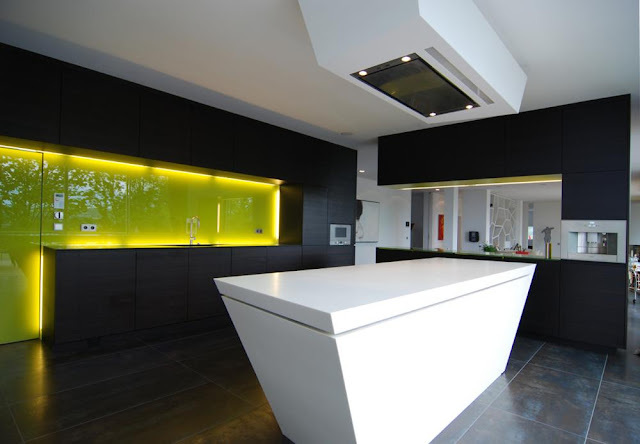 There is relative safety in this design as it is developed around tried and tested materials and incorporates some popular 2011 design trends, like the split level worktop and asymmetry. However the coloured units set in a rhythmic pattern on the left hand wall add warmth to the design drawing our eye towards the “Benetton Factor”. It is almost as though the artist creating this picture had some vibrant paint accidently drip from their brush and in doing so they have created something unique! Kitchens should be functional but they should also be fun! 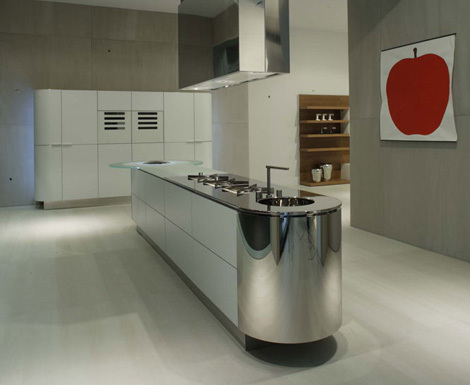 There is just something about approaching kitchen design from an artistic stand point that really surprises people. Design is about creating something that is useful; inventing something that solves a problem and fulfils a need; like a paper clip! But the discipline of design also offers a unique opportunity for an individual to shine; to make their well thought out solution more personal, there is room for self expression and artistic flare. 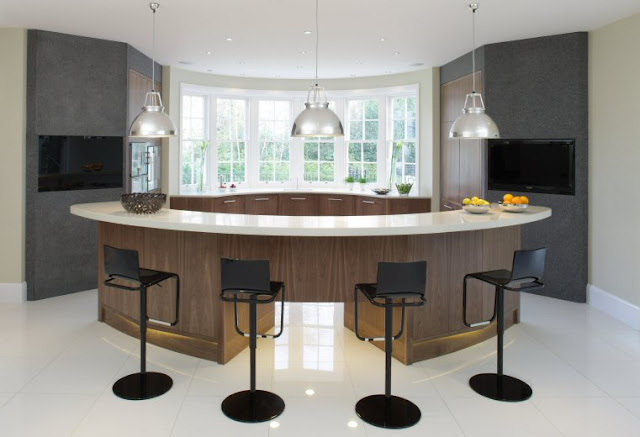 For years the idea of artistic design has been recognised and encouraged in furniture design and architecture but this idea has only become more main stream for kitchen design in recent years. Why has it taken so long? Have artistically minded and talented people been reluctant to get involved in the field of kitchen design due to the systematic under valuation of kitchen designers? Is it because the people using kitchens couldn’t see past their basic function, or has the idea of the artistically defined kitchen design been seen as elitist? 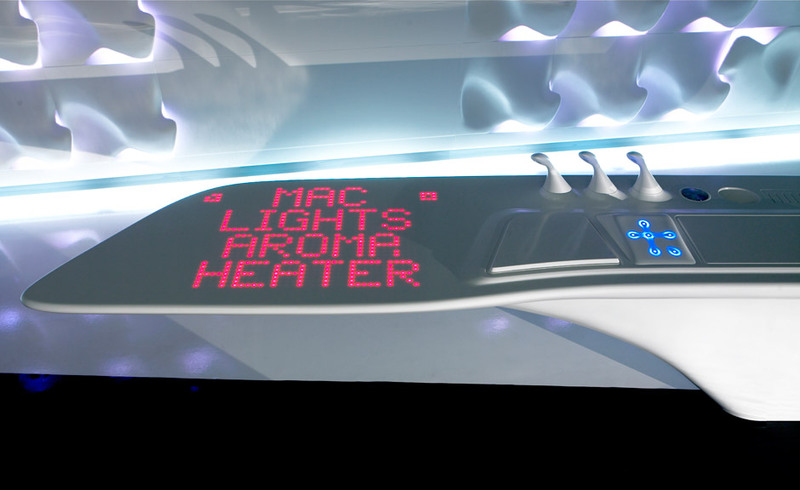 Has the advancement of more cost effective manufacturing techniques and new technology made the creation of bespoke, artistic installations easier to achieve? The Mogul cannot be sure, but would suspect that it is a combination of all of these things. No matter how you see things you will have to accept that the humble kitchen has seen a change in fortune in recent years becoming an extension of personal image...a must have fashion accessory that can promote affluence and style. As important as the car you drive! 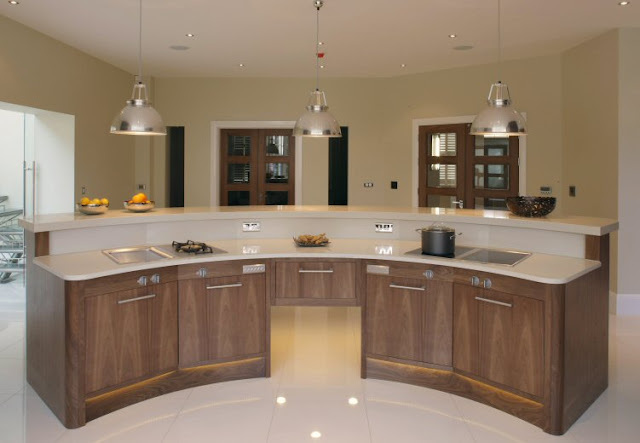 Whatever type of kitchen you choose to own you will find that the artistic element involved will be personal to you. Your style, your kitchen! 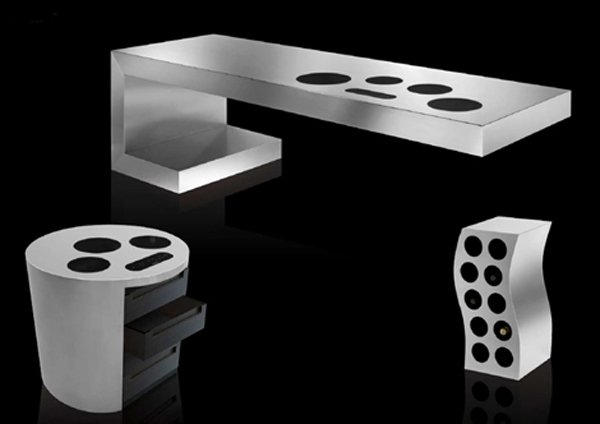 When considering these concept stainless steel islands it is easy to appreciate that they are the physical manifestation of an artistic mind. Obviously a kitchen designer would include an additional, equally impressive sculpture on which to prepare gastronomic surprises and culinary treats. 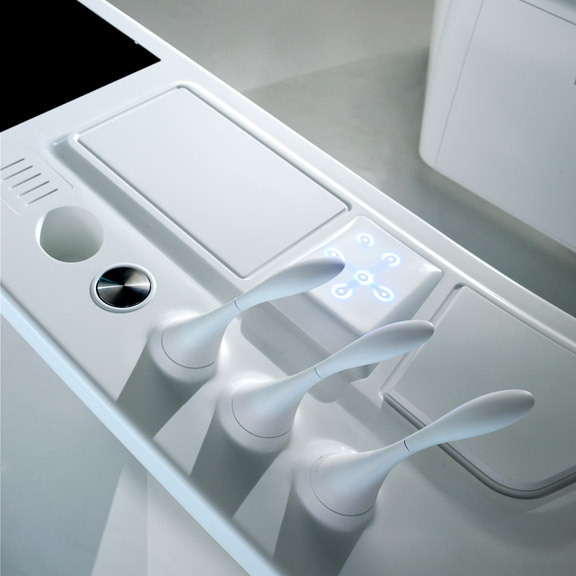 Kitchen designers can be described as frustrated artists with a pragmatic approach to culinary function. Please appreciate yours! 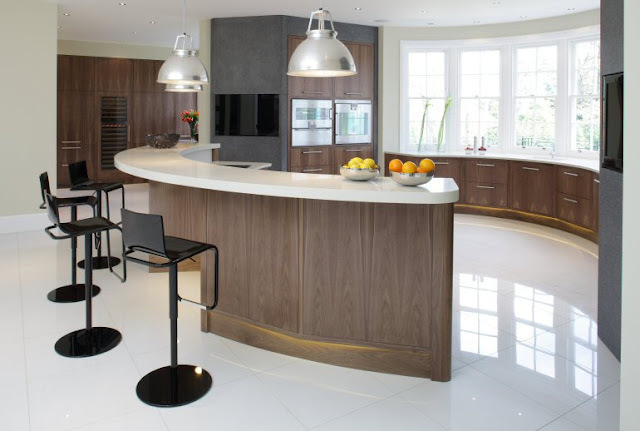 If you decide that you want a new kitchen you can be undertaking a journey of personal self discovery and unwittingly shouldering a social mantle, placing yourself before your piers to be judged and scrutinised. So why not decide to encourage some whispers at the local women’s institute coffee morning buy revisiting your youth and indulging in a kitchen design that challenges expectation. This kitchen is not a mid life crisis, it is an expression of the artist within you, the forward thinking design guru that you always knew you were and the person who will be admired for being different! Kitchen design is now a multi-layered discipline that has the ability to define not only the surrounding architecture but also the people who bring life to the space! 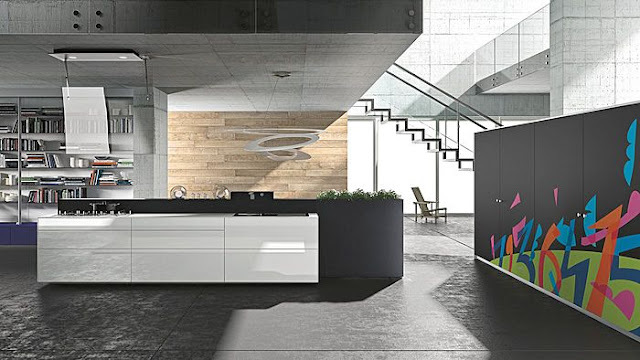 This design from the Contempora range by Aster Cucine is just beautiful; conjuring up an air of sophistication that inspires the viewer to get tactile with the finishes. 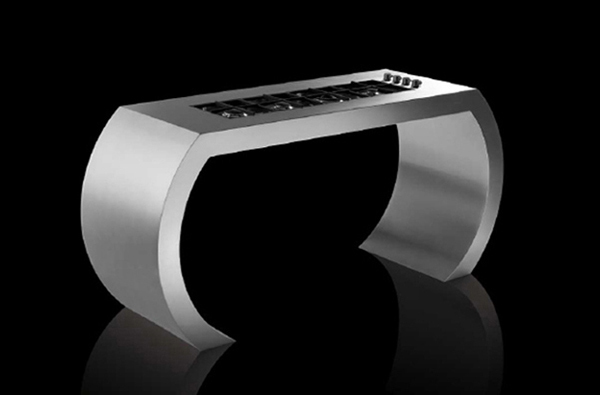 The semi recessed, polished metal finish presents you with a visual experience that could be likened to a futuristic aquatic gateway into another dimension. This shimmering, almost fantasy material invites the viewer to reach beyond the current realms of kitchen design and imagine what can be achieved when new materials and finishes are used. This metal finish also invites the light making the experience versatile and interactive, giving the design a new and powerful edge. However, The Mogul has to question the layout here..! The seated area reaches into the centre of the room obstructing access to the ovens from the main cooking zone and creating a challenging if not useless space between the back wall and the hob. You can never forget that a kitchen needs to be functional first and beautiful second....but in this instance The Mogul must make an exception! Who wouldn’t enjoy waking up to this scene every morning! This design is unusual, presenting a text book approach to contemporary kitchen design and yet giving us an unusual if not unsettling design contradiction. The kitchen itself is dominated by a sleek, monolithic island that has been anchored to a recessed plinth giving it a free hung appearance. The modern look has been enhanced by using smooth finishes and integrating the handles into the design; this popular combination of features gives this kitchen a clean and un-interrupted look! What makes this design different though is that it has been dressed in a recycled coat of many colours! From a simply aesthetical point of view The Mogul feels that the chequered pattern used to define the design is deliberate and un-natural, making the clean, linear lines of the design too busy and over dramatic; confusing the picture for the viewer! However, could it be that this is in-fact an emerging trend? The Mogul has noticed several designs surfacing of late that feature a tiled or mosaic pattern built upon a contemporary format! Cynically though it could be seen as over design! But amid this aesthetic argument is one fact that supersedes everything!....This design has been manufactured from recycled paper (Paperstone)! There is a real opportunity here to awaken the eco warrior within, and wallow in the satisfaction that comes from knowing that the kitchen you own is having no impact on the environment! For that fact alone we must salute the designers! Aesthetically! Argue amongst yourselves! Chromatics is the science of colour which tries to understand the subjective interpretation of visible light. The ability of the human eye to distinguish colors is based upon the varying sensitivity of different cells in the retina to light of different wavelengths. It can therefore be said that colour preferences are not based solely on acquired taste but that these personal inclinations are influenced by genetics! 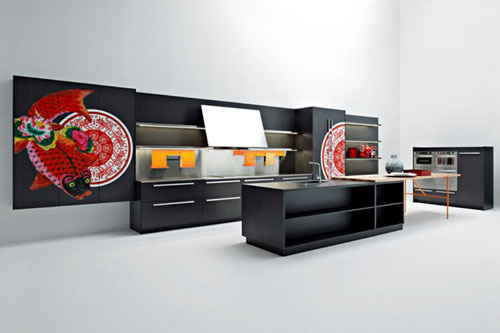 The modern kitchen has become an influential melting pot of ideas that encompass cultural attitudes to art and design. The kitchen has become a functional mannequin that can be dressed in cheap, colourful or expensive clothes fitting the client preferences perfectly and influencing architecture and interior design! How do you see your kitchen? Functional workspace, or a biological, socially influenced interpretation of light? Ask not what your country can do for you; ask what you can do for your country! These words may have been from an iconic American President who was struck down before his time but they could also be used as a patriotic call to all British kitchen designers to step up to the plate and create a masterpiece of functional craftsmanship that is deemed worthy of resting in the hallowed architecture of 10 Downing Street! So David and Sam wanted a new kitchen! 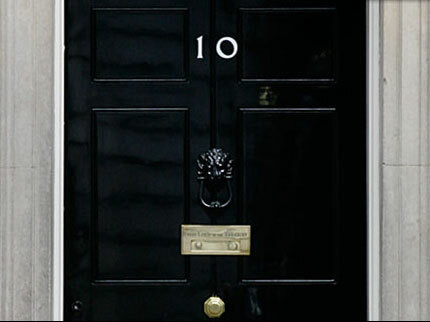 Well in Monday’s Daily Telegraph Christopher Hope reports of an official row over the installation of a new kitchen in the Prime Minister’s residence! Apparently officials have refused to reveal the cost of the installation which was described as “large and modern” and also exceeded Downing Street’s annual maintenance allowance! Well the Mogul is guessing that if this kitchen has been described as being modern it is probably not British?!!! German? Italian....oh... but sold by a British company! So who is worthy of answering the call for a truly British kitchen, are there any British kitchen designers or manufacturers fit for the Job? In a country that excels in the fields of architecture, fashion and design and that is innately proud of its design heritage...you would imagine that the choices would be many! But with so many British kitchen designers becoming indoctrinated by the products, ideas and design principles from other parts of Europe, choosing to “Buy in” instead of manufacturing, you might find it difficult to find a designer or company who is capable of creating a truly British kitchen. Would this kitchen of Britishness have Austrian drawer runners concealed beneath the English Oak dovetails?! The Mogul wonders! It could also be argued that only the best products from all over the world should be sanctioned by the chosen British designer to be worthy of this particular installation! The Mogul doesn’t know who installed the kitchen or where it came from...but after undertaking the job of your life the company or designer in question may have been sworn to the official secrets act! Watch out for the New Years honours list for further information! Here is The Moguls Suggestion for contemporary living Mr C! There has been a lot of effort put into this design in order to make it progressively different. The overall look is great with many of the contemporary “must have” design features being included; but could it be argued that this design is trying too hard? 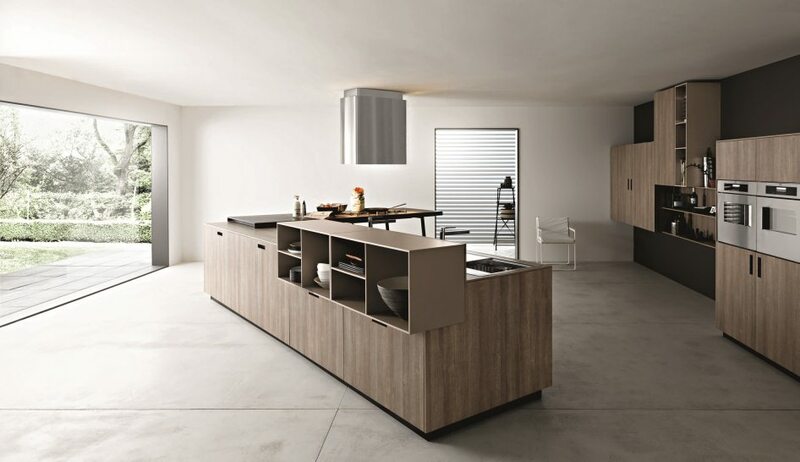 The island dominates the space and gives credence to the idea that the modern kitchen can be inspired by an island alone, and that if this element is designed correctly you don’t really need anything else. The islands dominance is helped further by it being positioned at an angle to the surrounding architecture creating the minimal, art gallery feel. But you really need to have ample room at home to get away with this idea, and you may have to present a strong case to your client, as doing this certainly eats up floor space. There is loads of worktop area here and The Mogul loves the off-set open shelves on the front of the island which are functional and offer a beautiful camouflage for potential mess at the sink. However, The Mogul feels uneasy with the asymmetrical positioning of the units along the back wall! They are abstract and tick one of the essential "contemporary kitchen trend" boxes, but The Mogul feels that there is too much open space between the floor and the units....what would this space be used for? This may be an example of how the quest for the most commercially appealing, aesthetically beautiful kitchen design can lead to a lapse in functional concentration! 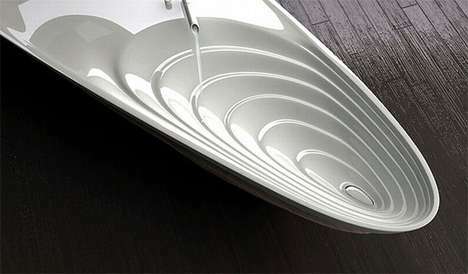 This design by TM Italia is edgy and fresh. There is absolutely no credence given to the power of human expectation; and the ancestry of kitchen design is celebrated by having another notch taken out of the evolutionary bedpost! 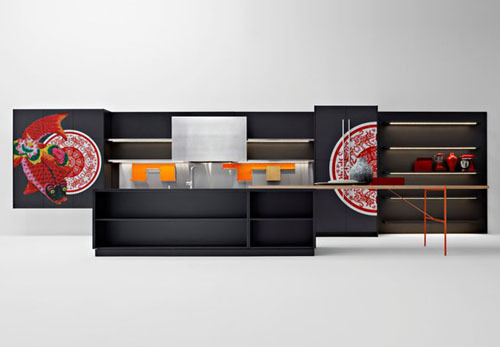 This concept is an embodiment of how powerful the discipline of kitchen design has become! The kitchen sits proudly in an open plan position of authority, satisfied in the knowledge that the rules of its inception are obeyed by both architecture and interior design. The “L” shaped supporting wall and tiled effects give the design a strange and yet catchy hook; it is almost as if this kitchen is not satisfied by having the entire living space bow to its position, but it also wants to invite the bathroom out to play! 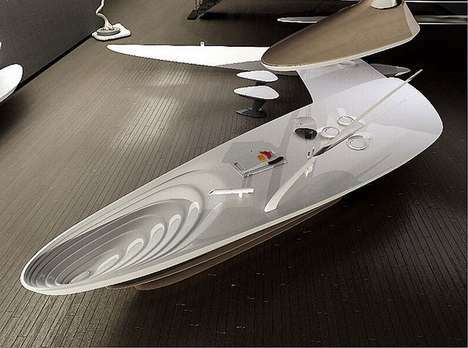 There is a strange and yet intriguing mix here that allows this design to step beyond the norm. The Mogul approves! This design celebrates the fact that architectural boundaries are being dissolved and that it is now cool to place your kitchen in the middle of your living room! Or is that the other way around?! 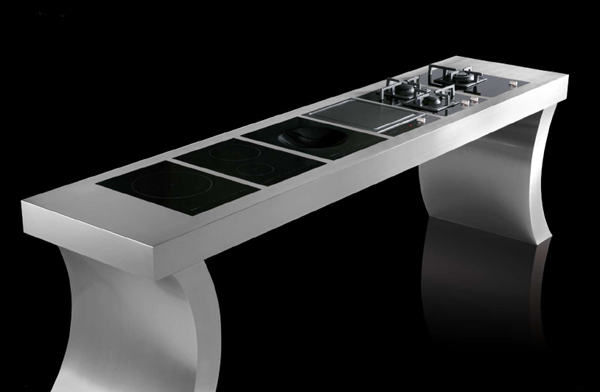 The Mogul loves how the two ovens have been given pride of place within this design. They have broken free from their traditional cabinetry shell; and it could even be argued that they now illegally squat in the most natural place for a plasma television! Is the kitchen now becoming a source of entertainment??!! And we’ll leave that point for another post! 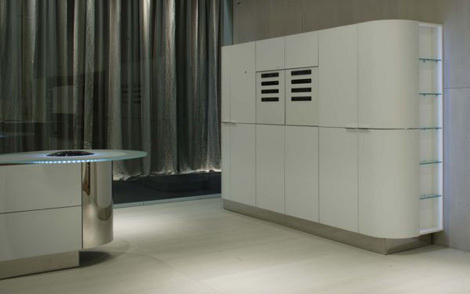 This design is functionally diluted and will therefore work perfectly within an open plan space! Let’s celebrate those kitchen appliances! When reinventing kitchen design you have to be prepared to accept a little criticism, after all, we always fear what we don’t know and question what is unfamiliar. So your knee jerk reaction to this design might be to think that it is too white, too clinical, to jumbled and too abstract! Oh yea...and there isn't enough worktop! However, The Mogul believes that this is an exceptional attempt to re-pour the mould, offering a visual experiment that uses light and shadow to animate the design. The appearance of this kitchen will change throughout the day as natural light arch’s across the space and imagine what would happen if you integrated some coloured lighting. There is a real disrespect for symmetry here with the design flaunting affection for multi layered height and depth; and by appreciating asymmetry the designer has created some interestingly, functional niches! This is not the kitchen your Mother had, but introduce the smell of freshly baked buns and some intimate, personal conversations and this piece of abstract functional art will evoke the same securities as the kitchen you remember as a child! There is just something about using polished stainless steel and glass that can allow a simple design to become more than just simple. The smooth reflective surfaces are vulnerable to human touch, in danger of becoming contaminated and spoiled by a clammy handprint. And let’s face it if you own this Argento Vivo kitchen from GeD Cucine you are bound to get a little hot under the collar! The centre island totally steals the show flaunting a gaunt, silky functionality that can only be compared to an anorexic catwalk model swaggering down the runway! 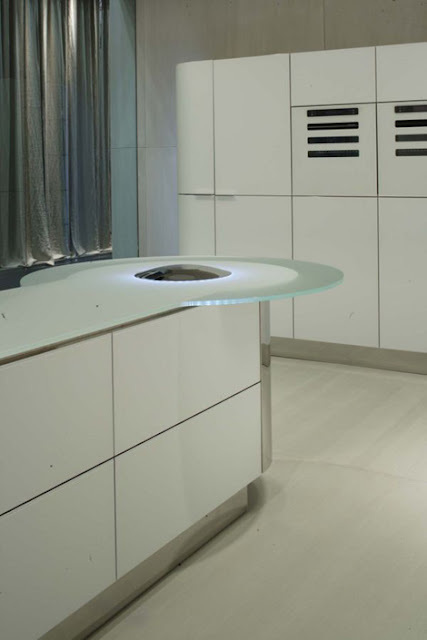 The island appears narrower than expected in order to allow for duel sided functionality and this aspect emphasises the elongated appearance of the design. The eye is finally drawn to the illuminated, acid etched glass table that glows like an inviting social beacon for family and friends. 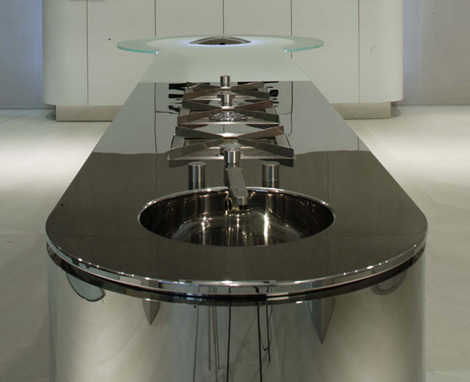 Without the island this design is ordinary....with the island it is absolutely exceptional! 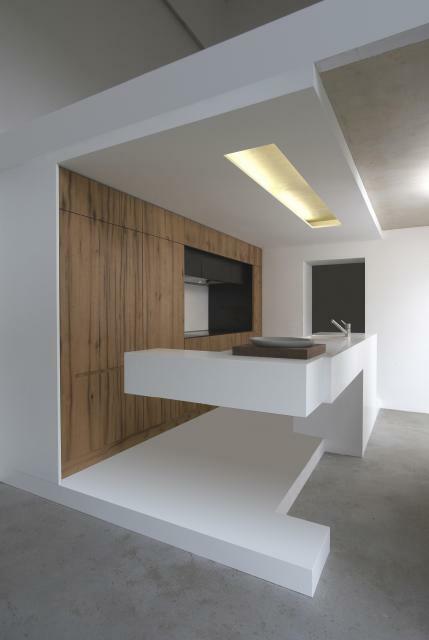 The new artistic medium of kitchen design! Functional self expressionism in the domestic gallery! Ask yourself what is the dominant influence here...kitchen or architecture?!? Is the kitchen actually becoming the architecture or is the architecture absorbing the kitchen, making it unobtrusive and neutralised? Kitchen design is changing in a way that is allowing a natural design discipline cross over and opening new doors of possibility. 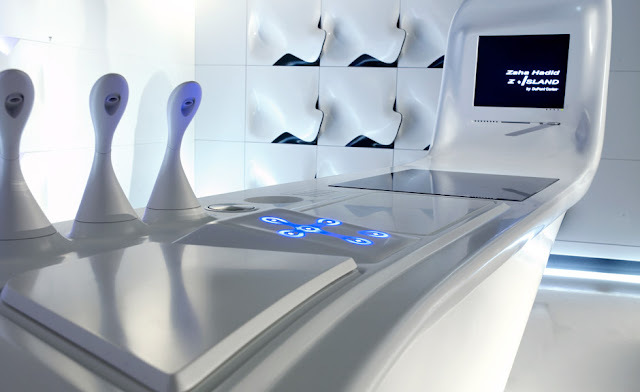 Kitchen pods and architectural integration is the next step along the evolutionary path for the fitted/unfitted kitchen; adding art and fashion to the mix along with an empathetic understanding of the human soul and you’ve pretty much cracked it! 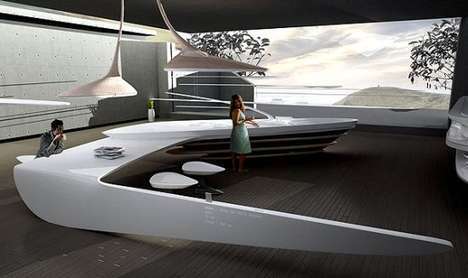 Kitchen design 2011 style! Most humans are blessed with 5 natural senses that allow us to translate our surroundings in a way that is individually subjective. This translation is given meaning though a history of personal experiences and our innate desire to understand new things. Next level kitchen design attempts to reach beyond the functional foundation of the kitchen and give the user an experience that can enhance their sense of well being, giving them pleasure! 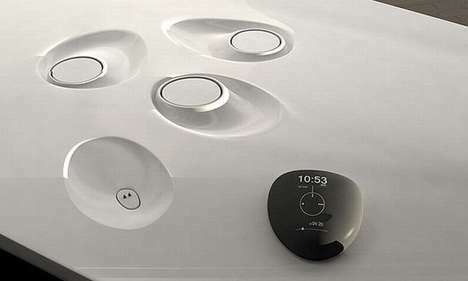 This design by Jaehoon Jung, which is aptly named; Pond Kitchen is designed to be visually stimulating and gives the user an auditory experience. The running water from the tap creates the natural sound of a stream or river against the specially moulded sink giving the design a new dimension and promoting calm throughout the space! The drive towards the kitchens harmonious integration into our architectural living space continues! This rendered design uses a monochrome palette to great effect giving the kitchen only enough definition to be noticed and offering continuity to the storage units within the living room. Future dwellings may not be defined by rooms but instead by the amount of open space that the interior architect can play with. The future kitchen designer will make the internal walls functional, integrating everything and utilizing ever inch of floor space. Offering un-structural room definition encourages a future proofed, design fluid environment that can be easily changed or manipulated without the need for serious structural work. The Mogul has said it before…Kitchen Design is Changing! 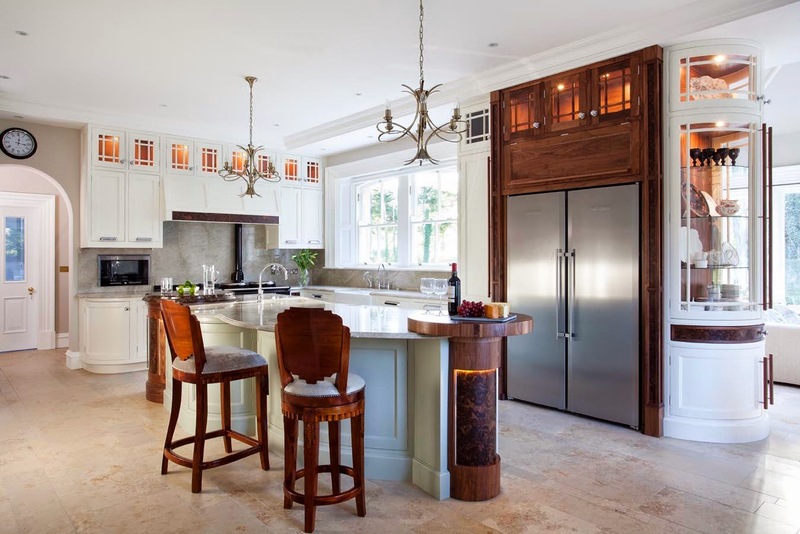 You have to understand that when it comes to kitchen design function comes first, so as long as you include all of the basic functional elements the design can be as extravagant or as compact as you or the architecture dictates. This image illustrates that less can be more and that by resisting the desire to include doors you can give the client a unique opportunity to dress the kitchen in a way which is personal to them. By using different coloured non-consumable items like plates, cups and glasses these open shelves present a blank canvas, perfect for expressing the quirky eccentric lurking within! This kitchen though, however artistic, however abstract and reminiscent of a cool boardwalk cafe is not maximising its true functional potential! The base unit shelves appear shallower than normal, reflecting the fact that low level shelves are not a functional hot zone and that most clients will only use the first 35% of a shelf to store consumable and non-consumables items. Kitchen designers fight a constant battle between form and function on a daily basis...the deciding factor on which one wins?!? The subjective human element! 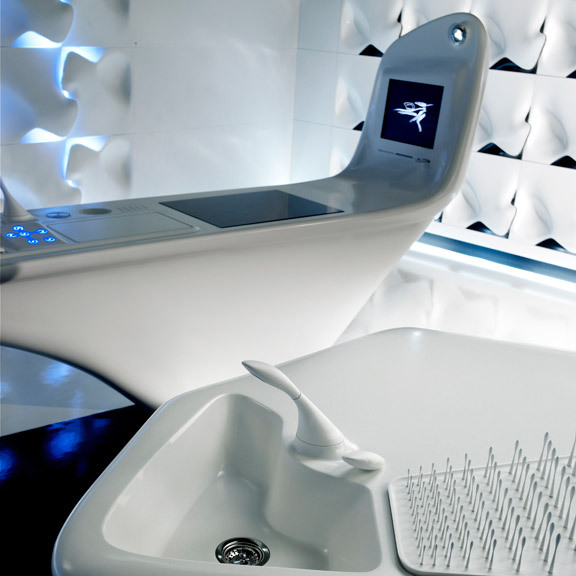 Functional and relaxation zones seamlessly combined! Welcome to the modern kitchen! Careful of that dropped worktop so close to the hob though!